Updated 02-28-2019 Several bug fixes. When naming a crate, the default name "Packing Crate" is once again shown properly on the dialog. Objects with a gardening component ("harvestable" plants) cannot be packed in crates as these will cause game errors. Objects with a flowing puddle component (e.g. broken sinks or toilets) will no longer cause exception errors in the game as they try to create puddles inside the crate. The puddle component is turned off prior to packing the object. Do not allow the pet cages from My First Pet Stuff to be packed away. These have been reported as causing issues which can lock up your game. Updated for the June 19, 2018 game patch (version 1.44.77.1020). Some objects that cannot be placed on the lot automatically are now no longer allowed in the household inventory. I've identified at least the majority of these and they no longer are allowed to be packed in a crate, however these items (primarily windows) may already be in a crate and upon unpacking them they will simply be deleted. Unpacking from a crate on a floor other than the ground floor will now place the unpacked items near the crate rather than onto the ground floor. Updated for and requires game version of 1.40.61.1020 (02/22/18) or newer. Adds newly required on_inventory_change_tooltip_updates tuning for inventory item components. Version is no longer supported. Removes the need for any compatibility fix for other mods that alter the inventory enums (S4_03B33DDF_00000000_40441721EB0ACFAC). This is now modified directly by the script. Bugfixes to make compatible with newer versions. This will likely work with several of the more recent game versions, but I can't test it on those. Updated with Spanish localisation. Thanks gato_24! This version ought to work fine for 1.14 as well. Since someone reported fish decay being broken again, I also made an edit that sets the fish decay in sim inventories to 0.2 (i.e. it includes the functionality from Fish Freshness Fix, in case that would be useful again for the current game). 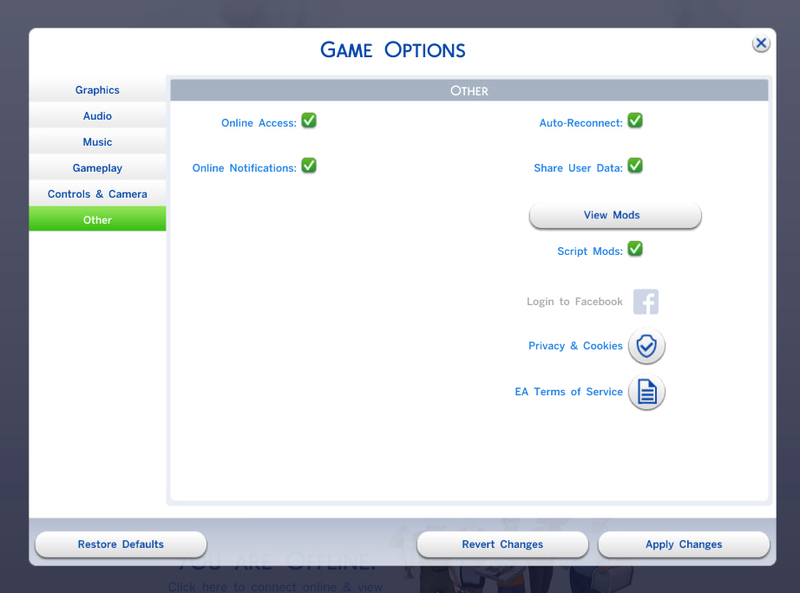 I don’t currently have fisher sims so I didn’t test whether this was actually necessary, but it won’t hurt. 07-24- 2015 - Bugfix for players with Spa Day to fix a bug with the Spa Day aquarium objects. 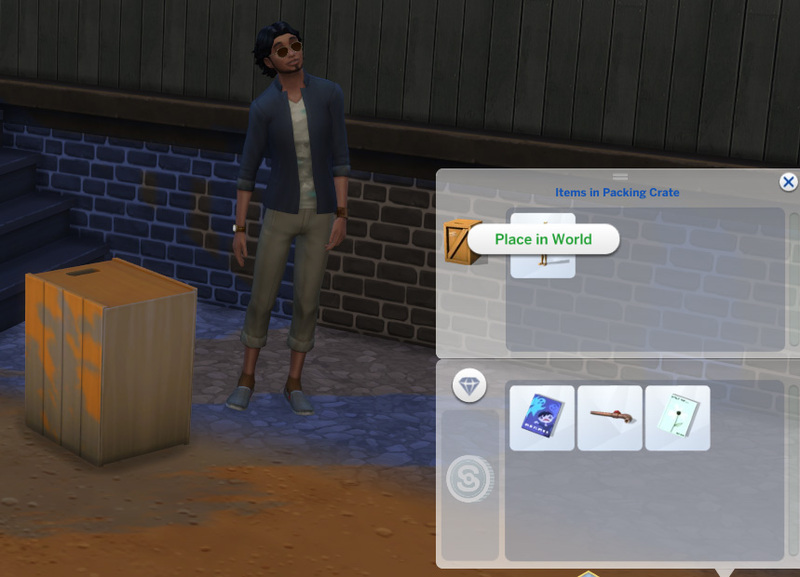 02-20-2015 - Sim's can now use a crate when visiting another lot. Sim's can still only pack items owned by their household. Unpacked items will persist on lots, but will continue to be owned by the sim's household. So if you leave something on a lot you can return later to pack it back up. After unpacking an item, the crate's inventory will now automatically reopen. 07-18-2015 - Updated mod for better compatibility if player does not have Get To Work. Many items which previously could not be packed should work. To enable packing, click on any packing crate and choose "Enable Packing". The trait that controls the menu is "non-persistent" so it will revert to off when reloading. Added Chinese translation (June 25, 2015), thanks egureh! Added a new crate, provided by Plasticbox. Thanks! Added Russian and German translations, thanks to KuriXarya and Plasticbox! If the XML package was not installed, or was in a subfolder, the script would cause errors resulting in a crash back to the world select. The crash bug has been fixed - but it is still important that both the package and script files be in the same folder for crates to work properly. So one afternoon about three weeks ago, a sim of mine that had grown up to a young-adult wanted to swipe some of his parent's neat household items when he moved out. He asked me if it was possible to move them from one house to another. "No!" I replied, "It simply can't be done!" But he had an interesting idea, "What if you made a box that was big enough to hold a piano, but small enough I could fit in my pocket?" "Ridiculous!" I said. "Impossible!" I snorted. He just grinned, "You made lockable doors, most people said that was impossible...."
That sounded like a challenge to me... and I love a good challenge. After three weeks of work, many failed attempts and dead-ends, and a serious quantity of coffee, I'm ready to unveil Packing Crates for The Sims 4. This mod adds a "Pack in Crate" menu item to every item in the game (with a few exceptions) that cannot be normally placed in an inventory. Selecting this menu choice will search the lot for a free packing crate and move that item into the crate's inventory. If no packing crate can be located on the lot, the action will be cancelled. Crates can be purchased from Storage/Miscellaneous in build-buy for 150 simoleons. The crate was cloned from the crate end-table in the game and will also still serve as an end-table if you want. 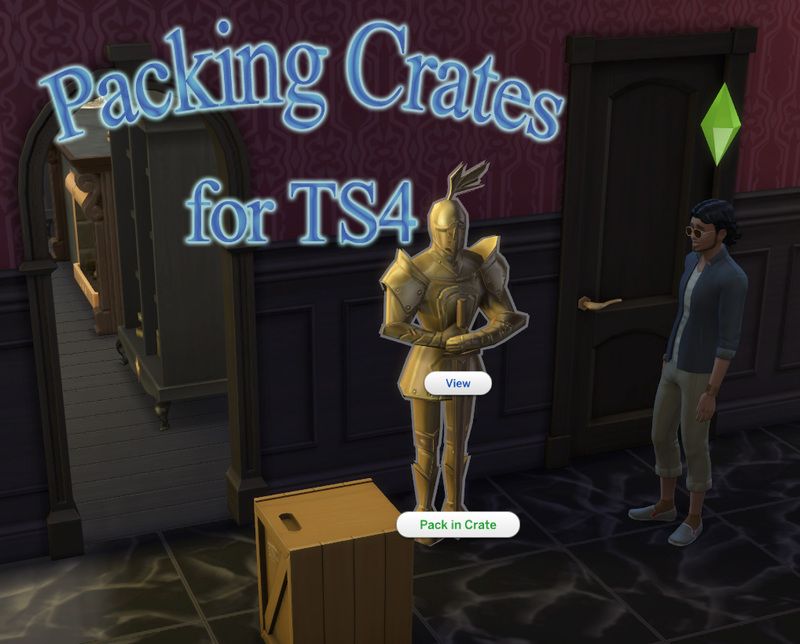 After packing objects into a crate, the crate itself can be placed into a sim's inventory and carried with them to a new home. Crates can also be left around the lot for use as storage (or end-tables). To unpack a crate, place it into the world and open it's inventory. Clicking on an item in the crate inventory will result in a "Place in World" menu choice. The object will be placed near the crate (it will always appear on the first floor). If the game cannot find a place for the object (for instance, paintings and other wall-art will not place automatically) then the object will be placed into the household inventory. Notifications will appear if there are any problems. The menu choices and the ability to store objects in the crates are added dynamically by the script portion of the mod, so this is compatible with custom content objects, and all expansion packs (even new unreleased ones). Warning! - It should be noted that if you remove the mod, any items that are stored in crates will disappear along with the crates themselves! You may want to make sure you unpack all crates on all lots prior to removing the mod. There is one bug that I have been unable to figure out, but it's not a game changer. The code has been written to take great care with your objects and not lose them in a move. 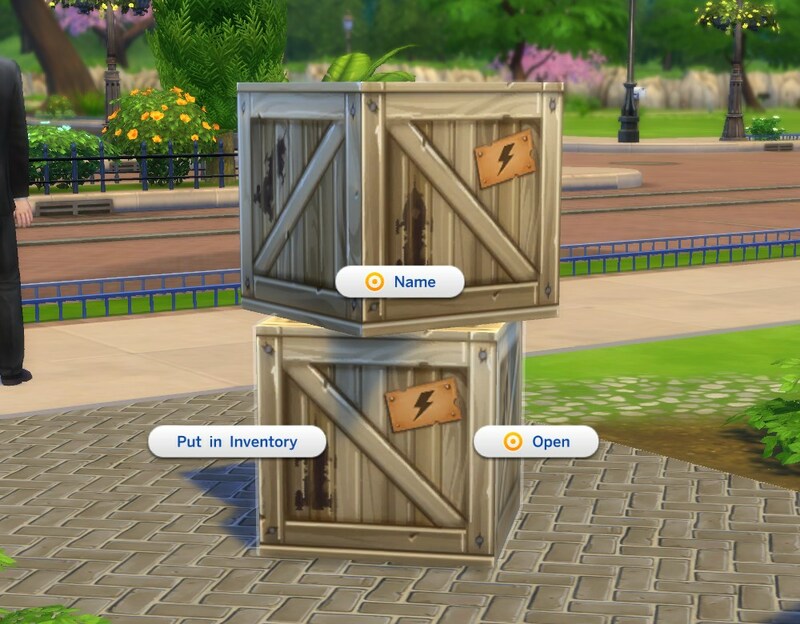 When a crate is placed in the sim's inventory, and then the sim moves to another lot or the game is saved/reloaded with that crate in their inventory, when opening the crate it will show all the objects in it as being a stack of two. This is an interface glitch only, there is only one copy of the object in the crate and it will unpack normally. However, after unpacking one copy of the object will appear to still be in the crate's inventory. It's not really there! If you click on the crate version of the object, the menu will appear as if you clicked the actual object, which is confusing but I can live with it. The remaining ghost object will go away the next time the game is saved and reloaded. Ghost items that have not yet been unpacked will also straighten themselves out if the crate is placed back on the lot and the game saved/reloaded. Weird... but it doesn't really hurt anything. I'm not sure if the problem is fixable without changing the game's user interface code which is not very accessible. This mod was written and tested on Windows for The Sims 4 version 1.47.49 (Nov 13, 2018). This mod uses the ts4script file format for the script portion of the mod and cannot be installed automatically with a mod manager (until a mod manager is updated to support these files). To install the mod manually, extract both the package and ts4script files from the download into your mods folder. Nobody's bought me a Mac yet, so until I hear from someone who tries it out, I can only assume it will work on a Mac. I don't know of any reason why it wouldn't work. The mod modifies one of the game scripts in ways that may not be compatible with other mods, but that would be their fault, not mine!